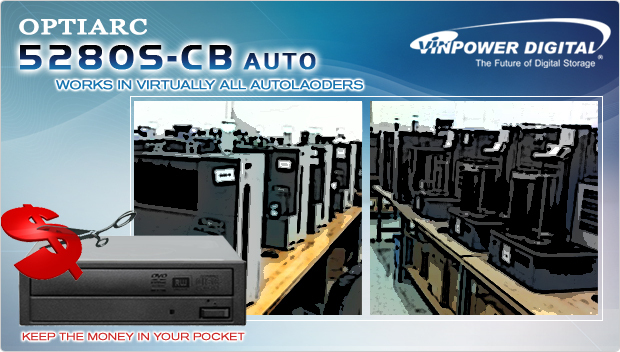 Vinpowerâ€™s line of Optiarc 5280S-CB Auto is the preferred drive when one needs to replace worn out drives on existing robotic autoloaders. There have been a number of robotic autoloader manufacturers who unfortunately, could not continue to operate during the hard times of the financial crisis or who have been so diminished, they simply canâ€™t provide the kind of support necessary for customers using robotic equipment. In other cases, the autoloader operators are running at such slim margins, they cannot afford to replace the drives in their existing systems, because the manufacturerâ€™s out of warranty component pricing, including drives, is outrageously overpriced. In fact, the nature of an autoloader duplicator is to be able to run 24/7 and copy huge volumes of discs with minimal human intervention. There are cases when drives break down, or wear out over time, and thereâ€™s nothing that can be done but replace them. With autoloaders, unlike manual towers, you canâ€™t just swap out a drive with any similar model off the shelf. So the user is stuck in a dilemma, where the manufacturer may either no longer be in business, or charge such an outrageous amount itâ€™s cost prohibitive to change the drive. Fortunately, Vinpower has a solution. The Optiarc 5280S-CB Auto CD/DVD recorder drive works on virtually every loader on the market and comes at a far more reasonable price tag. In fact, youâ€™d be hard pressed to find a system that doesnâ€™t accept it. So, instead of trashing a system you paid thousands of dollars for, or shelling out hundreds of dollars for a replacement drive, contact Vinpower or an authorized Vinpower representative to inquire about the Optiarc 5280S-CB Auto and keep your production running at full strength! In an effort to accommodate the expanding global marketplace, Vinpower Digital has partnered with TEAC to distribute the entire line of TEAC optical disc and flash duplication equipment and printers! Vinpower Digital, a recognized global manufacturer and distributor of digital duplication equipment and accessories, will now add another very popular brand name to its arsenal of products. 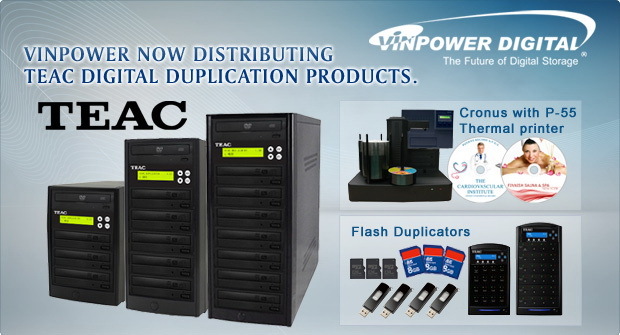 Vinpower has announced that it has initiated a partnership with TEAC to distribute the full line of TEAC optical disc and flash digital duplication hardware as well as TEAC’s line of thermal printers. “TEAC is pleased to establish a partnership with Vinpower Digital, that will help promote and grow the full line of TEAC digital duplication hardware and thermal printer products,” proclaimed Les Luzar, VP Sales & Marketing at TEAC America, Inc.
TEAC offers a series of standalone manual tower CD/DVD, Blu-ray, USB flash, and SD/Micro SD duplicators, along with the P-55 full color thermal printer that works on optical discs, and select USB pen drives. For more information about the full line of TEAC Duplication hardware and thermal printers, please visit www.vinpowerdigital.com.